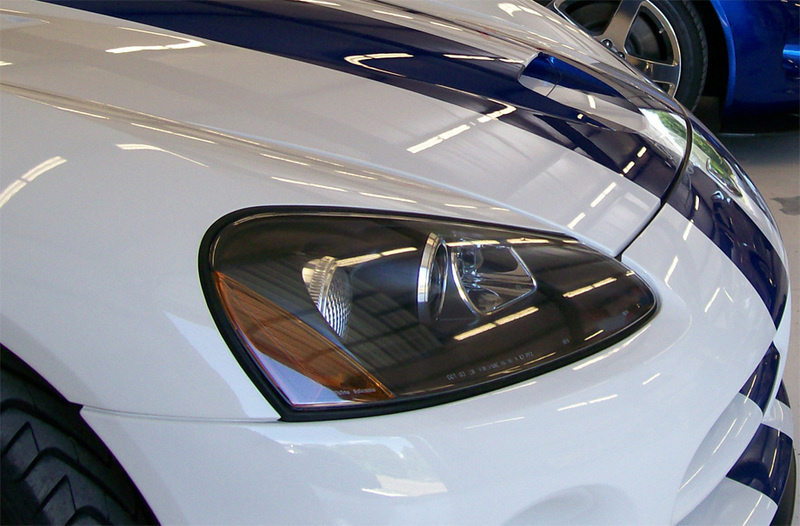 Why do Paint Protection Films (Coated or Uncoated) need polished? 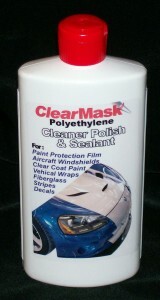 clear protective product the space-age vehicle paint protection answer. Individual features that prevent your paint from being chip by thousands of small high speed missiles. coat paint systems. However the soft physical nature of paint protection film differs from the harder acrylic polymer clear coat paints used on modern vehicles. 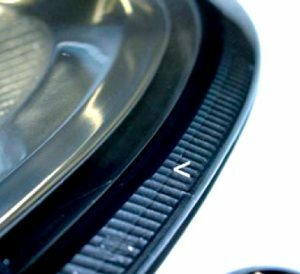 Because the surfaces are different it is important to maintain your paint protection film and paint with polishes that are compatible on both surfaces. This will enable both surfaces to show dust and dirt on the surface approxametly the same by equalizing the surface tension of each. 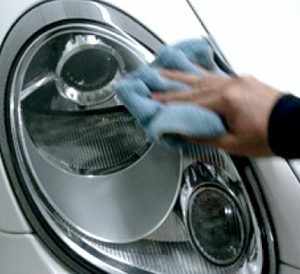 Paint protection films (coated or uncoated) that are not regularly polished will show dirt and dust noticeably different than your clear coated paint surface. are shipped. These polishes simply will be removed during the wet installation process by the soap and alcohol installation liquids. This is simply sale hype and of no value. Good quality wax based non abrasive, non silicone polishes work well if used on a very regular basis. 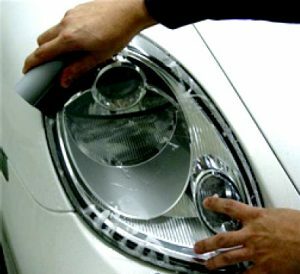 ClearMask offers a unique exclusive acrylic polymer cleaner polish and sealant that has been developed for all paint protection films (coated and non coated). This product actually polishes the surface with a crystal clear non-yellowing, no-wax, no-silicone polymer polish and sealant that is clear coat paint safe. Full Frontal, Plus ClearMask EconoKits "More Kit For The Buck"
Creating the best Paint Protection Film value for our customers has been a passion here at ClearMask since this industry's inception in the early 1990's. 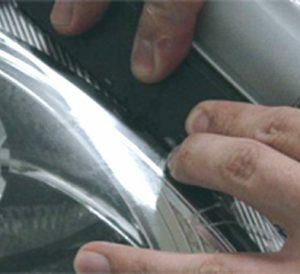 With our exclusive Computer Aided Design software we have been able to group our Paint Protection Film Kit Designs to create the NEW ClearMask Econo Kits. A value packed Full Frontal, Plus clear bra paint protection film kit at a fraction of the cost over what it would be if you were to purchase these kits individually. 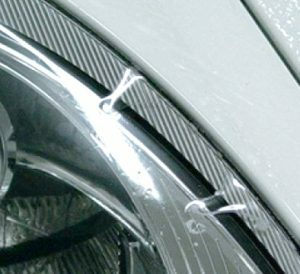 The paint protection film industry's pricing is driven by the square inches of material required to cut a specific kit design. Due to the high cost of these aerospace derived films each and every open space not used in a specific cut file becomes expensive waste that is thrown away in the manufacturing process. The vast majority of our competitors do not create Paint Protection Film kit designs (Just Ask Them). They acquire them from third party software programs already grouped in kit form and have no real control over the square inches of film required to cut a specific kit. This creates a huge waste in materials. We have been designing our quality kits since 1993 and have a great opportunity over our competition to take advantage of our technology by utilizing the vast waste in kits by grouping multiple kits in the same area. This saves film, saves the environment letting us go "GREEN" and saves you Big Bucks by allowing you to protect more of your valued vehicle investment for less. With our exclusive CAD software we can simply take the wasted film and create more kit coverage at less cost. 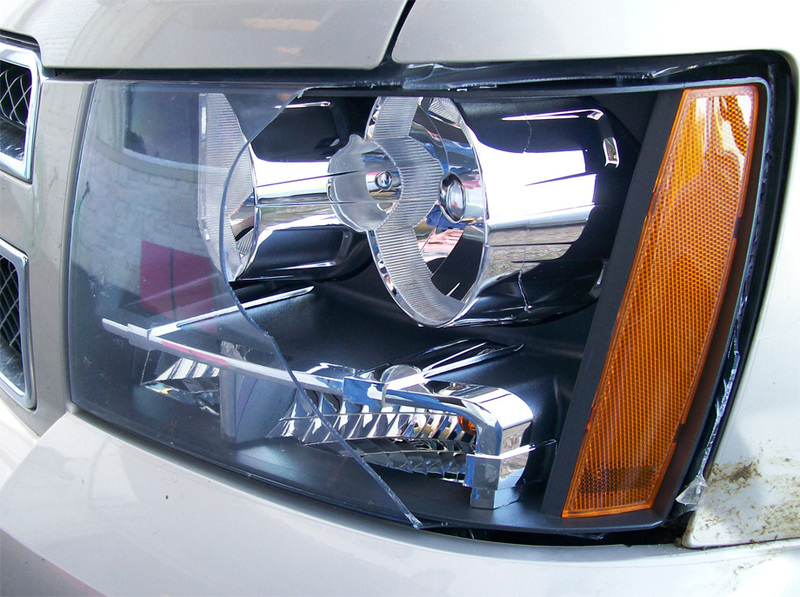 A typical Hood, Fender, Mirror and bumper kit can have as much as 50% waste in the cut files. Remember many paint protection film kit software packages are supplied by the film manufacturers themself and they have no interest in saving film, just the opposite-the more film used the more they sell. We felt that the customer could directly benefit with greater coverage protection for less money if we simply grouped more of our most popular kit designs into one file. Why not? It does not cost us anymore. With some adjustments to files we were able to minimize waste while giving you, the customer, a better value. Please consider our ClearMask Full Frontal, plus EconoKits. 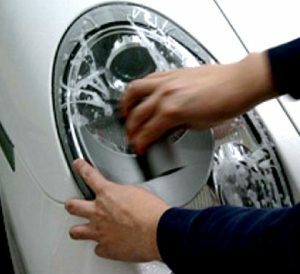 Paint protection film offers consumers so many opportunities to protect their valuable property that its uses can only be limited by ones imagination. All you need is a smooth surface like that of your cell phone or your laptop. We have had people protect furniture, counter tops, medical equipment, and brass hand rails. A whole new industry has started with companies using our ClearMask Films to create kits for consumer electronics products such as i-pods, I-phones and other valuable possessions. 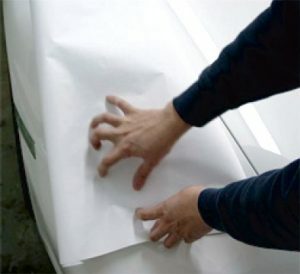 This Blog will show you how relatively easy it is to create your own pattern using our AeroGard film from 3M's Aerospace division. 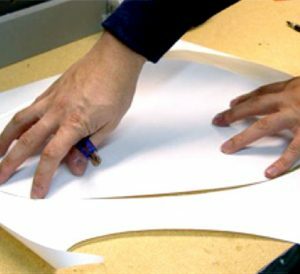 These simple techniques can be used on almost anything you want to protect that is not to large, complicated, or possessing severe compounded curves or cutouts. 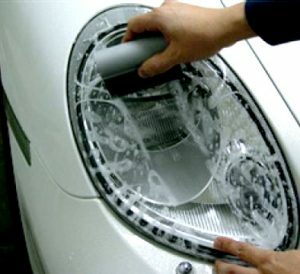 We will demonstrate self patterning using a Porsche headlight.The first thing you will want to do is prepare a clean work surface that you can cut on. A clean shop table is fine. 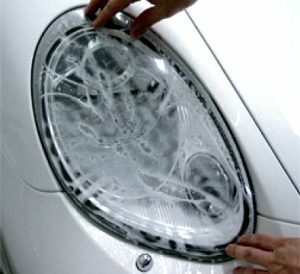 Clean the surface of the part (headlight) you are patterning well. We suggest a solution of approximately 1/2 to 1 teaspoon of common dish washing soap to a quart (32 oz.) of water in a spray bottle. 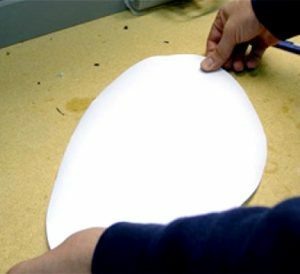 After cleaning the part you are patterning, spray a mist of the cleaning solution on the part and place a rough cut piece of film (approximate size) on the wet part surface with the adhesive release liner facing the part (down) and the clear urethane facing up. The wet surface will help hold the film in place creating a capillary action between the thin film and the part. NOTE: Be careful with liquids around electronics. 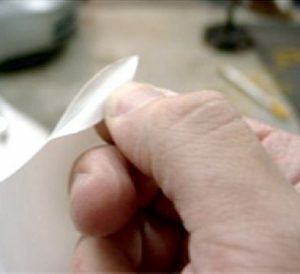 Use a fingernail to trace an outline around the part making sure not to move the film from its position. Press hard with your fingernail and you will leave a temporary crease mark in the soft self healing urethane to help you see where to trace your pattern with a marker or pen. 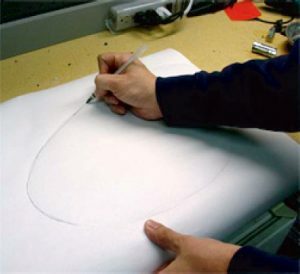 Trace your part using a ball point pen, fine tip marker or grease pencil. 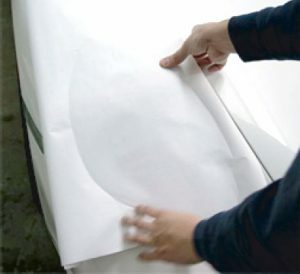 Remember AeroGard is extremely flexible so when tracing it is better to trace the part short than long. 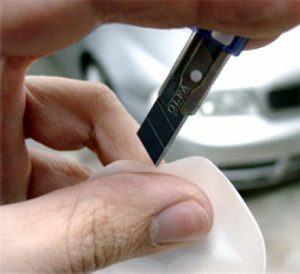 You can always stretch the film but it is more difficult to cut, especially on the car. Now that the part is traced you can transfer the film to the cutting surface and cut it completely through using a sharp razor knife or scalpel. 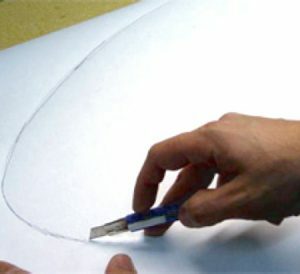 Tip: If you do not have a suitable cutting surface ordinary sharp scissors work well to cut the film in fact some professionals actually prefer scissors over knives. Inspect your cuts making sure you have cleanly cut edges. Dry test fit your design with the clear film facing you and make any adjustments as needed. Use release liner as a pattern in reverse for the opposite light. 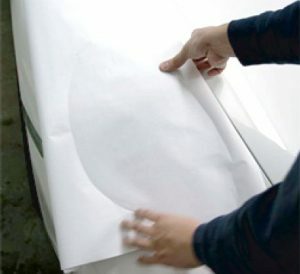 NOTE: The above process can also be done using paper to create a dry pattern that can be transferred to the AeroGard film. We like the wet technique using AeroGard because this product is the only product in the industry that has a conformable adhesive release liner that can be worked with while wet. It is also the clearest non light distorting film in the industry. Now its time for application. Place your knife blade or other very thin object (pin) between the film and the adhesive adhesive liner in order to separate the two parts. While pulling the two parts apart, spray application liquid between the parts being careful not to get fingerprints on a dry adhesive surface and spray liberally while removing liner completely . Spray the part surface liberally with the wetting solution prior to application. Place part adhesive side down onto the parts surface and align it by sliding into place. Spray liquid on outside surface of film so the squeegee will glide without prematurely gripping and sliding the film. With the part in position, hold the film with one hand and start to squeegee the wetting solution from under the film. Your squeegee strokes should be from top to bottom and center out to prevent wetting solution from migrating back under your squeegeed film. 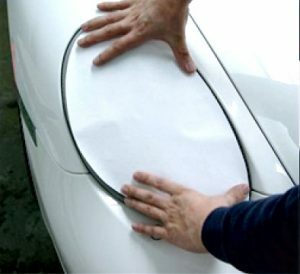 If you have some compound curves in your part, don’t be afraid to squeegee one corner to tack film in place and with your free hand stretch some of the wrinkles out while squeegeeing. When you have squeegeed the major amount of wetting solution for under the film you may have finger like bubbles that form and will not immediately lay down after squeegeeing. Do not panic, these bubbles form due to stress and excessive moisture still under the film. Spray a small amount of alcohol and water (25% alcohol 75% water) between the film and part to be covered. 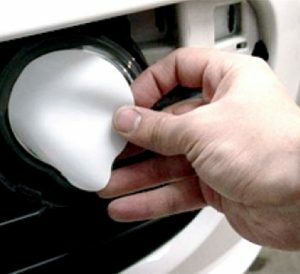 This simply promotes adhesion by rinsing the soap residue from under the film. Once the moisture has evaporated the film should adhere permanently. Sometimes a little pressure from a warm finger holding the bubble down will aid also in initial adhesion. Use a micro fiber or soft paper towel to remove any over spray or liquid from the film edges. 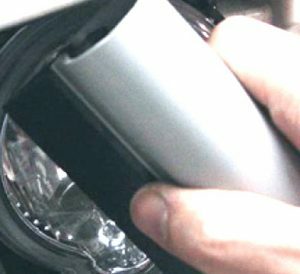 Making sure the film edges are sealed good is important for a clean application. Water bubbles that remain in the film after squeegeeing will all dry out clear over time. Any dry air bubbles can be removed by piercing with a pin from the side and squeezing the air out with finger pressure. Now move onto any additional parts you may have designed. You are almost done. After all the parts are installed it is important to go over your work making sure that no bubbles have popped up at the edges and all the edges are sealed down and adhered. Good job you just saved a lot of money and have created protection for you valued possessions. 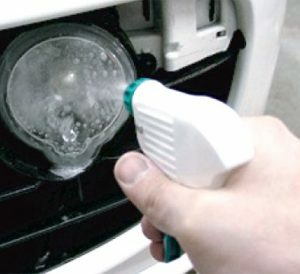 People are asking us on a regular basis why they have to be concerned with protecting modern vehicle headlights. 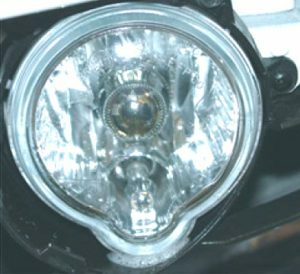 The general feeling is that because headlights have moved from glass to acrylic plastic they are not vulnerable to the problems that glass lenses had. WRONG! The fact that modern acrylic headlight lenses can be formed to incredible shapes, matching and sometimes dictating body lines is great for styling but that's where it stops. New modern acrylic plastic lenses scratch, haze, stone pit and crack causing foggy appearances that can restrict and distort light output. They can get hit hard enough to pit and crack the lens enough to not be visually noticed but let in moisture creating fog within the light itself destroying the interior of the light. In certain cases, the lens can actually be shattered. A customer of ours actually hit a bird with his new Suburban that broke the whole side out of his headlight. 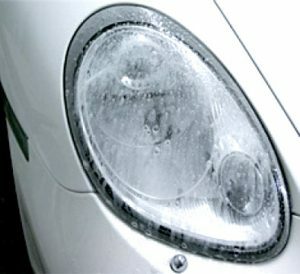 After more than a $1000.00 replacement cost he now has our LightGard light protection film kit. 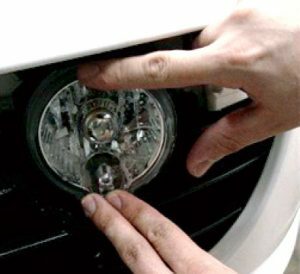 Gone are the days of replacing a broken headlight from the local auto parts store for 15 to 20 dollars. New acrylic lenses are expensive. A new headlight for a Lexus ES350 is $983.57 a Lexus LS460 is $1920.83 and a new Corvette headlight is well over $1500.00. Those are investments worth protecting. 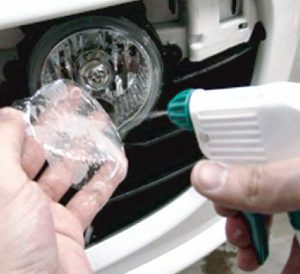 There are many light protection devices on the market today but most of these products are thick (30-50 mil) semi clear or tinted colored plastic that use generic pressure sensitive adhesive systems with no formal testing. Beware of these. 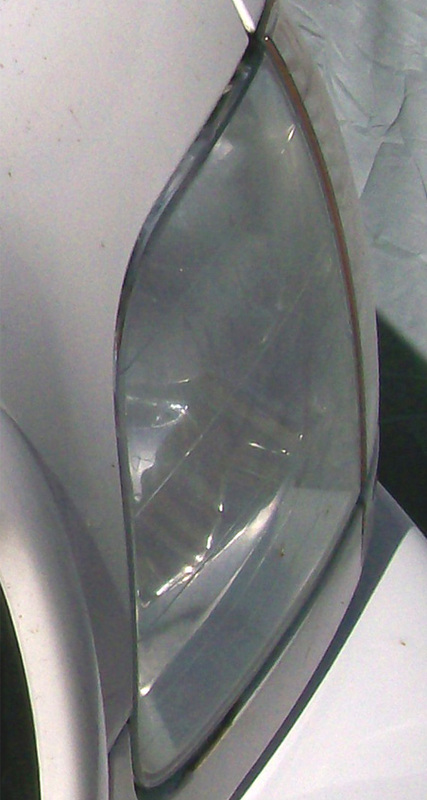 They are very stiff hard to apply to compound curves of modern vehicle headlamps. They tend to reduce and distort light as well as come loose and fail especially when temperatures drop below freezing. 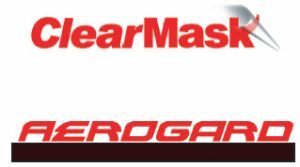 For example our exclusive LightGard light protection film is made for us ClearMask) by 3M's aerospace division and is the same film they use for commercial and ilitary aircraft ray dome (nose cone ) boots. 3M aerospace has done extensive testing on this optically clear film at the University of Dayton Research Institute. They tested the film used in LightGard at 500 miles per hour and at temperatures as low as -30 degrees centigrade with simulated 1" rain without showing damage. Total test procedures and results are available at www.clearmask.com. 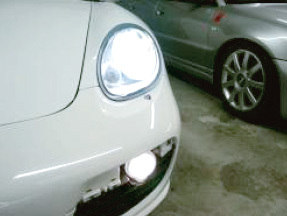 Modern headlight protection is well worth the investment!